Since 1961 Olson Electronics has specialised in the design and manufacture of mains distribution panels and is an established supplier to many leading UK companies. The company has been responsible for many of the innovations in the distribution panel market and still lead the way with new ideas and original products. In 1998 Olson Electronics moved to their premises in Stanmore, Middx. The new factory has 27,000 square feet of production and office space which give them room to expand with their ever increasing production. Olson Electronics design and manufacture all of the their own mains distribution panels. The in house facilities include a metal shop, spray shop, assembly area, testing facility, packaging, dispatch and stores and a R&D office. Distanced from the hi-fi industry Olson manufacture a quality of product thats not available through the hi-fi channel at this price. Need to clean up your electricity supply? Then Olson Electronics new range of mains distribution blocks could be the answer. Available with four, six or eight standard 13 amp sockets housed in an earthed, self-screening steel housing. 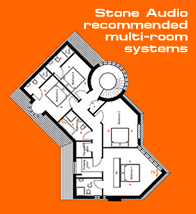 The 'Sound Fantastic' range of units are specifically designed for both the home and professional hi-fi audio markets. Each unit is fitted with a 10A mains RFI filter with earthline choke and transient suppressor, designed to filter mains borne transients, switching surges, RF interference, intermittent spikes and other disturbances.